I decided to go back to my original view of this corner. Having completed the last exercise, I preferred not knowing what was around the corner. I also decided to add in two people to create a more interesting composition. The exercise suggested using traditional colours and a limited palette with which to gradually build up tonal values. I found this really useful in thinking about tone without getting caught up in colour choices. However it was difficult to know when to stop as I found myself keep on going back to add more depth of colour. I’m still not sure if I have created enough contrast and depth. 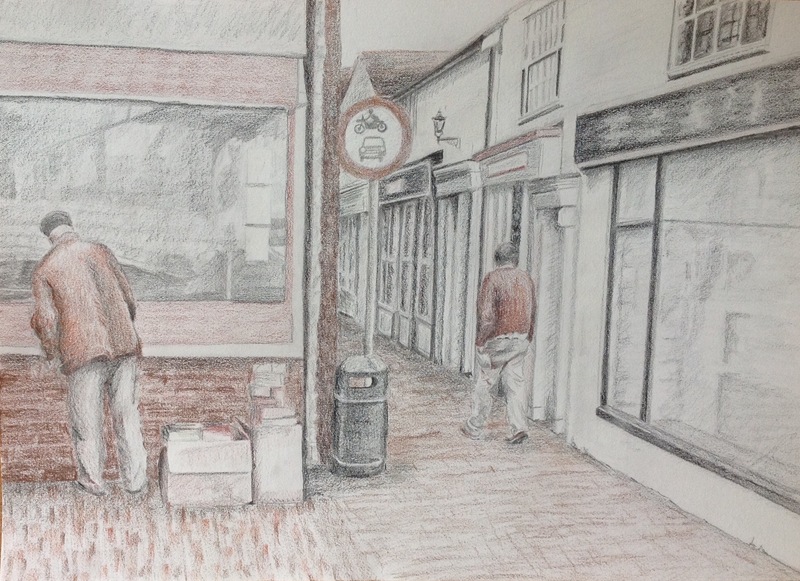 Overall, I am pleased and feel this is a more interesting composition and I particually enjoyed drawing the people and thinking about how to describe the reflections in the shop windows.